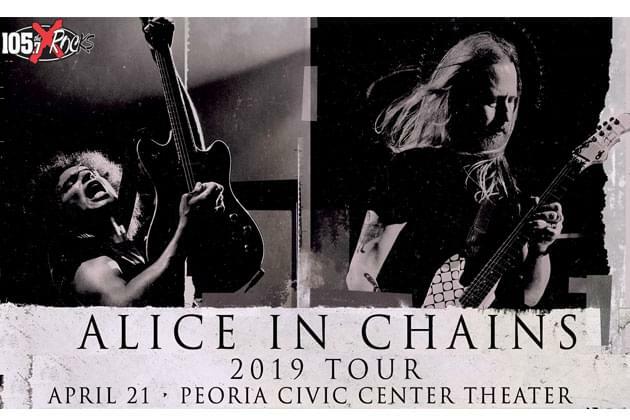 The X Welcomes ALICE IN CHAINS Back To The Peoria Civic Center Theater April 21st! Jerry Cantrell, William Duvall and their band mates are back to Rock Peoria! The new Alice In Chains album, “Rainier Fog”, has been released, and is Grammy Nominated! The band will no doubt jam and showcase all of their amazing material from all of their six studio albums. You know the songs, “Rooster”, “Down In A Hole”, “Them Bones”, “Man In The Box”, “No Excuses”, “Grind”…..the list is endless! There’s only one Alice In Chains Rock station in Peoria and all of Central Illinois, it’s 105-7-The-X! See you at the show! Listen up for chances to win tickets! Presented by national shows 2, and the Peoria Civic Center! Let’s Rock!